After days, weeks, months and years visiting the forum, I finally write my first real post here. I humbly started my first name game... It’s not finished, and it will be more a demo than a game. Making it with NESMaker (by Joe, one of my new 8bit heroes), my game started some weeks ago, and evolving with the different versions of the beta. Great tool and very instuctive tutorial videos, to learn how to use NESMaker and the basics on ASM with NESMaker, and inspiration on the nesmakers forum. I modified some code, added some functionalities specially for my game. I made 3 levels for this demo... this demo would be a introduction to my game to come (when NESMaker will be out and have more functionalities). All I need: A damn fine cup of coffee! Last edited by dale_coop on Mon Aug 13, 2018 5:20 am, edited 1 time in total. Man this NESMaker thing is turning out to be pretty cool. Love seeing projects from people who wouldn't be doing a NES game otherwise. I'd test your game but apparently FCEUX doesn't like mapper 30. I'll see if I can find a compatible emulator later. But now, I understood some basics and I continue to learn, make some basic code, subroutines, with NESMaker. I am happy now... cause I thought I would never be able to make a NES game. The game might work with FCEUX, I use it too (2.2.3 version on pc). This emulator is one of rare ones supporting MAPPER30. It worked for me on FCEUX and console, Everdrive. Pretty neat for a start. I don't know if diagonal movement is in the works, I feel movement would be a bit less clunky with diagonal, but 4 directions isn't too bad to get used to. Looking forward to seeing the progress. Thank you WhiteHat for your comments. For the diagonals, I will see if I can do better. A lot of parts of the game come from the NESMaker tool (the engine, movements and its physics, collisions,...) but everything is tweakable. A lot of parameters and we can modify/write/add our code. What do you, guys, think about the player speed? Is it too fast? My son tried to play and he had some problèmes with the speed, too fast for him... caused him a lot of deaths (ok my son is 5 years, but he is impressively good st games). 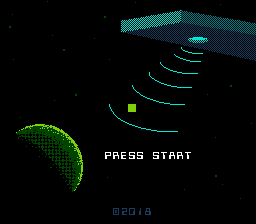 The most important thing about NESMaker is that I made an almost NES game! All you guys here are my motivation and my inspiration, every year more gorgeous and incredible games you make. I know some of you think that make a game with NESMaker is not the same than making a game from scratch. But it’s my starting point, hoping that one day I will be able to make one from scratch too. I played up to level 2 and the speed is an issue. Is too easy to hit one of those 1 hit kill ball causing you to restart the level. The game by itself was interesting and it showing potentia.l Once the placeholders will be replaced with characters, unless the cubes are the characters, it would give more style too. As for the diagonals, it depends. It could make it better or will change the balance of the game. It should be tested with both control scheme to see how people reacts to it. Kirby was reportedly originally a placeholder. Thanks for the feedbacks guys. Yeah the cubes, love those, but they are kinda placeholders... like others basic graphics until I make a real game with this prototype. If I find a graphist. i will make te player a little slower, and try with diagonal movements (for the real game maybe). I will try to finish this prototype this week. Hi I saw your game over at the nesmakers website and downloaded the demo and played it. I also have my project that I made with nesmaker posted here in this thread section. So I have some questions for you. I didn't make it through all of Joes nesmaker tutorials, but your 4 way movement is the same as my 4 way movement. In addition if you spam the D-pad and try all kinds of crazy combinations you can glitch out the character. It happens in mine and yours game. Do you know anyway to remedy this? I think diagonal movement would be way better than just 4 way movement. If you figure out 8 way movement please let me know so I can so the same in my game. I actually like the abstract art style. So don't need actual drawing of characters to make a game since a game can be literally anything. I am also having a very hard time understanding nesmaker and I think that the program is very rough around the edges. Do you agree? Like you can only edit once screen at a time and there are hot keys that you have to know that you would never know about if you weren't told about them. You also cannot copy and past an image from a paint editor program into the paint editor program in nesmaker. Yeah, being still in beta, NESMaker is quite rough currently. I think it will become more and more complete and easy to use with time. It's not a problem for me. I watched all the tutorials videos, a lot of times for some. As you said, it's hard to master so those tutorials are necessary. You can't understand well the tool without those. For the diagonal movements, with some inspiration from another forum member post, I wrote some code to do that (I will post on the NESMaker forum). It's not perfect, but it's a good step. Yeah sometimes, graphics can be glitchy... but ti's beta and prototypes Need more time to fix every bugs. I updated my "game", I coded the 8 way direction and slowed down the player. You right, it's better now. If you want, you can download again, and try... I would be happy to have your feedback on that. I have almost finished the last (3rd) level. I think the final version will be release for this weekend or next week.